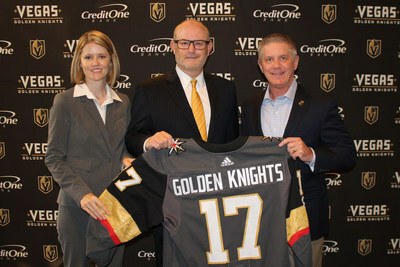 From L to R: Laura Faulkner, Credit One Bank Vice President of Marketing Communications, John Coombe, Credit One Bank Senior Vice President of Marketing Communications and Kerry Bubolz Vegas Golden Knights Team President pose with Vegas Golden Knights jersey. LAS VEGAS, Aug. 1, 2017 /PRNewswire/ -- Credit One Bank, one of the largest and fastest growing issuers of credit cards in the United States, announced today a multi-year integrated marketing partnership with the Vegas Golden Knights. "Credit One Bank is excited to announce our sponsorship with Las Vegas' first major league NHL franchise, the Vegas Golden Knights," said Laura Faulkner, vice president of marketing communications, Credit One Bank. "As a national company headquartered in Las Vegas, we are looking forward to supporting our home team and seeing the increased energy the sport will bring to the community." In addition to sponsoring the team, Credit One Bank will be actively involved with the Golden Knights Foundation, both through a significant financial contribution as well as with a seat on the Foundation's Board of Directors. Through the Foundation, the Vegas Golden Knights along with support from Credit One Bank seek to support exemplary Las Vegas nonprofit organizations that help make a positive impact in the local community. "The Vegas Golden Knights are thrilled to have Credit One Bank as the Official Credit Card sponsor of our team," said Kerry Bubolz, Vegas Golden Knights Team President. "We are proud to partner with a brand that shares our commitment to service in the community and introduce them to the excitement of the hockey world, especially in our inaugural season."